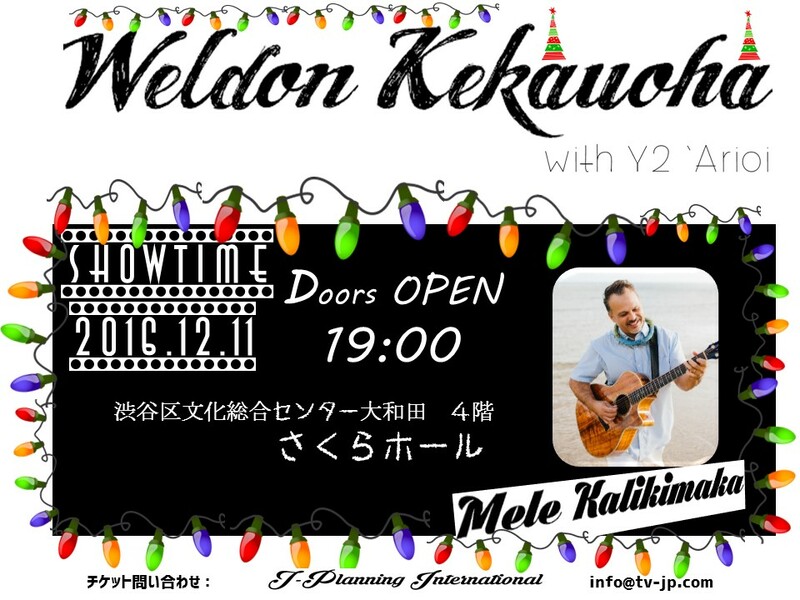 2016年12月11日　Weldon Kekauoha Premium Live with （株）Y2 - J-Planning International Co.,Ltd. December 11, 2016 will be a night to remember. We will be hosting a concert to kick off the Christmas season. We are so delighted to be able to work with such a wonderful and talented musician who has been nominated to the Grammy Awards and has also won multiple awards at the Na Hoku Hanohano Awards in Hawaii. We are honored and pleased to announce our collaboration with WELDON KEKAUOHA. WELDON KEKAUOHA brings such an amazing feeling of ALOHA to the stage and we hope to share his ALOHA with you to bring in the MELE KALIKIMAKA season. We hope to see you there and look forward to seeing you at the concert. We have a lot of surprises for your and hope that you are looking forward to having a wonderful and festive evening with us. From us to yours MAHALO and ALOHA!